The Labour Party is undergoing a crucial period of change and renewal under the leadership of Jeremy Corbyn, Vice President of CND. The influx of new members and new grassroots organising groups like Momentum are transforming the party into one based around the values of peace and socialism. 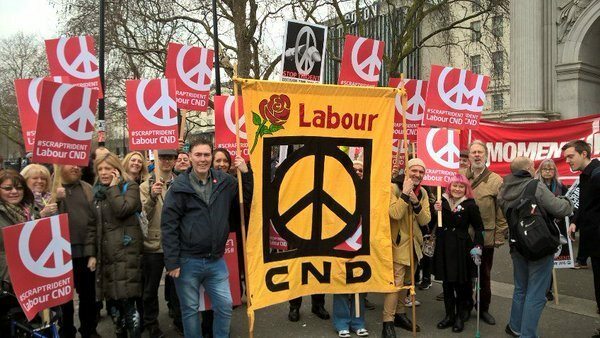 Labour CND is open to all Labour Party members who are also members of the Campaign for Nuclear Disarmament. Here in Yorkshire we are bringing together party members from across the region to campaign for peace and disarmament. We’re fortunate to have many Labour MPs in the region who are long term supporters, including Fabian Hamilton MP, shadow minister for peace and disarmament. If you’d like to be kept informed of local organising meetings for Labour members please get in touch. The September 2017 Conference of the TUC in Brighton successfully passed Motion 17 ‘Defence, Jobs and Diversification’, calling on the Labour Party to set up a Shadow Defence Diversification Agency (DDA) as a priority. The resolution was supported by many Trade Unionists working in the armaments sector, including the Unite workers at Rolls Royce in Derby. The resolution builds on the proposal for a Defence Diversification Agency that was published by Jeremy Corbyn in 2015 as part of his bid for the Labour Leadership. A report from the Nuclear Education Trust, an independent charity, launched in Parliament on June 26th 2018, concludes that it would be possible to disarm the UK’s Trident nuclear weapons system without massive job losses, on the basis of evidence from defence diversification projects around the world. The lead in decision making on diversification must come from the workers and their communities, although a broad partnership involving all stakeholders is also necessary. Action must be taken at early stages to proactively assist communities in diversification. Suggested timelines to organise and plan for diversification range from three to five years as a minimum. Funding must be available for organising those involved, analysing the situation, planning and then implementation. Existing organisations, relationships and expertise needs to be identified and employed to ease the transition into more competitive civil markets. This could be assisted by joint ventures and network learning. Labour’s 2017 Manifesto commits that “Labour will lead multilateral efforts with international partners and the UN to create a nuclear-free world” (p120). In July 2017 122 nations (the majority of UN members states) voted to introduce the “Treaty on the Prohibition of Nuclear Weapons” which would outlaw the production, stockpiling or transportation of nuclear weapons in line with other weapons of mass destruction. The UK has boycotted all the negotiations that have led to the ban treaty. Here in Yorkshire we’re proud to have four Labour MPs who’ve signed the ICAN Parliamentary Pledge to promote the ban in parliament, Leeds North East MP Fabian Hamilton has stated, in his role as peace and disarmament minister, that a Labour Government would sign the treaty. Get involved in your local Branch and CLP, we’re very happy to find speakers for local labour meetings just get in touch. Any member can submit a resolution to their local branch, they should be submitted to your branch secretary at least two weeks in advance of the monthly branch meeting. If resolutions are passed the secretary should submit them to the Labour Policy Forum website and if appropriate put them forward as a resolution to the next CLP meeting. Below are some resolutions which have recently been passed in the region. You can also submit resolutions directly to Labour’s Policy Forum website, there have already been some interesting submissions, so please add your comments and your support.